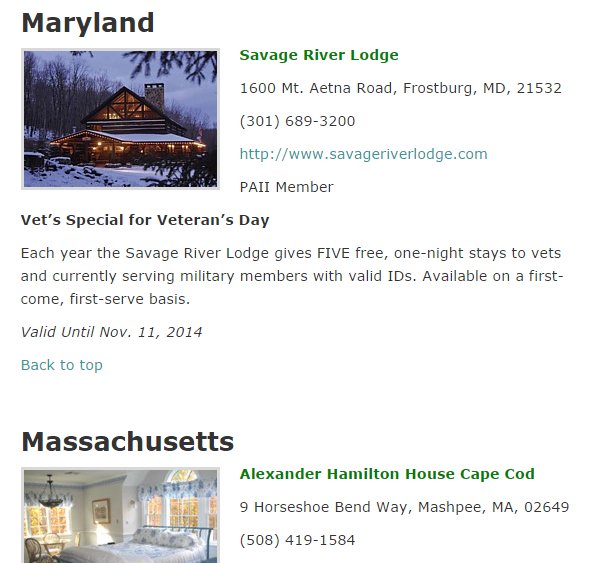 One of the great services provided on our 2014 Veterans Day Discount Page is B&Bs for Vets. Each year, over 250 Bed + Breakfast locations open up their inns free of charge to veterans. 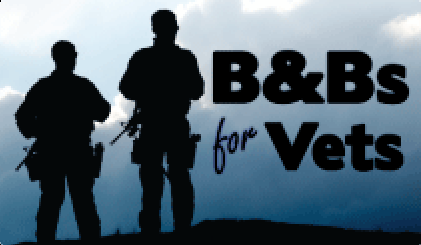 This is the 5th Annual "B&sB for Vets" celebration. This year it takes place on Sunday (Nov 10) and Monday (Nov 11). Scroll down to the list of states and click on the state you live in. Pick a location you would like to stay and call their phone number to see if they still have available spots. Many locations have limited spots so don't wait too long! A military ID or discharge papers may be required to prove military duty and active or prior military duty will be verified. Please be prepared to show evidence of prior military duty if asked by the innkeeper. A credit card number may be required to hold the room. We ask that all those participating understand their card may be charged for the full amount of one night’s stay in the event of a no-show. The room is only free if the guest shows up. Rooms are limited. Once they have filled at an individual inn, military and vets can try another inn, but are asked to be respectful of innkeepers if there are no rooms available. New inns are joining the program each day, so be sure to check back. Vets may bring one guest to stay with them. Most guest rooms at inns and B&Bs accommodate two people maximum and while some B&Bs can accommodate children, many are not appropriate for children 12 and under. Additionally, while some are pet-friendly, many inns/B&Bs are unable to accommodate pets. Please be aware of the property’s guidelines and rules before making a reservation, and follow the policies and guidelines for maximum in the room, cancellations, etc. Almost all inns and B&Bs are smoke-free. Some may provide outdoor locations for smoking but many do not allow smoking in or outside whatsoever. Last year, thousands of active and retired military were treated to this generous overnight free offer. What a awesome idea. From their website - "Thank you to our veterans and active military for your service. We hope you’ll come stay with us over Veteran’s Day!"